30 years ago in London my German neighbor baked every Saturday, but would never share many recipes. My favorite was an apple cake, the top and bottom was a very thin layer of something between a pastry and a sponge cake. The filling was large chunks of firmly cooked apples. I have searched since then and never found anything like it. I have no idea how she made it, any ideas? 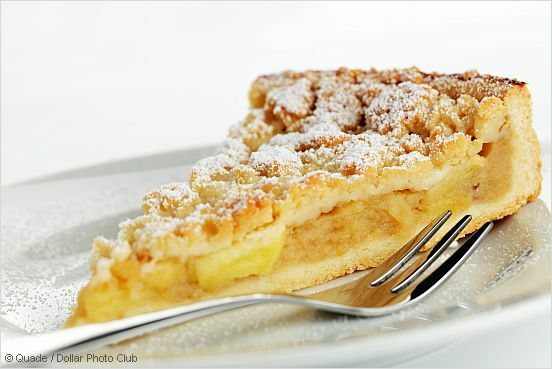 We know various types of apple cake (Apfelkuchen) in Germany, and recipes abound. I suppose your neighbour made a gedeckter Apfelkuchen (covered apple cake). So here is a recipe you could try, hopefully it is similar to what you are looking for. * Mix the flour and baking powder, add the other ingredients and stir using a hand mixer with kneading hooks. Briefly knead the dough with your hands, form a roll and let it cool for at least 30 minutes. * Peel, quarter and core the apples and cut them into slices or smaller pieces, whatever you prefer. Sprinkle the apples with lemon juice to prevent they get brown. * Melt the butter in a pan and lightly braise the apples with sugar, cinnamon and raisins. Let the mixture cool. * Cut the dough into 2 halves, roll out the first piece of dough (larger than the size of the pan) and place it into a greased 26cm (10in) non-stick springform pan , form an edge about 3cm (1 1/8in). * Spread the apples on the dough, roll out the rest of the dough and cover the apples. Press the edge of the cover against the dough edge you formed before. * Prick the dough cover here and there with a fork. * Bake in a preheated oven at about 180°C / 350°F for 45 to 55 minutes. Check the cake after 40 minutes, possibly reduce the heat to prevent the cake is getting too dark. * Prepare a thick paste from icing sugar and lemon juice to cover the cake while it is still warm. Thank you so much. The covered apple cake is exactly what I have been searching for all these years. I was searching for pies and cake. Just never realized the correct term to search for, so was never able to find. Amazing. the correct volumes are the grams. It is not easy to convert grams into cups as we don't use cups in Germany. Various books and research on the internet always come with slightly different results. According to this chart 400g flour would be about 3 1/3 cup. And there is also a difference between sifted and not sifted flour. Please note that it is said on that page that the measurements are slightly rounded off. The dough might be a bit dry and crumbly when you use the hand mixer. But when you knead it a little with your hands it should turn out okay. There is enough butter in it to make it smooth. There is either too much flour or too little liquid for this recipe to work. Similar cakes use about two cups of flour. Please advise on correct volumes.